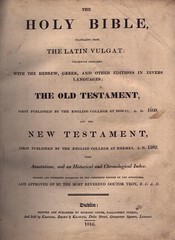 Title The / Holy Bible, / Translated from / The Latin Vulgate: / Diligently Compared with the / Hebrew, Greek, and Other Editions / in / Diverse Languages, / and First Published by / The English College at Douay, / Anno1609: / Newly Revised and Corrected, According to the / Clementin Edition of the Scriptures. / with Annotations / for Clearing Up the Principal Difficulties of / Holy Writ. / Vol. I. [of five] / Dublin: / Printed by Richard Coyne, / and Sold by Keating, Brown, and Keating, London. / 1811. Title The / Holy Bible, / Translated from / The Latin Vulgat: / Diligently Compared / with the Hebrew, Greek, and Other Editions in Divers / Languages; / The Old Testament, / First Published by the English College at Doway, A. D. 1609, / and the / New Testament, / First Published by the English College at Rhemes, A. D. 1582. / with / Annotations, and an Historical and Chronological Index. / Revised and Corrected According to the Clementin Edition of the Scriptures, / and Approved of by the Most Reverend Doctor Troy, R. C. A. D. / Dublin: / Printed and Published by Richard Coyne, Parliament Street, / and Sold by Keating, Brown, & Keating, Duke Street, Grosvenor Square, London. / 1816. Comments Controversial edition that repeated annotations from the original Rheims New Testament of 1582. Title The Holy / Catholic Bible, / / Containing the Whole of the Books in the Sacred Scriptures, / Translated from the Latin Vulgate, / The Old Testament, / First Published at the English College, at Doway, 1609 / The New Testament, / First Published at the English College at Rheims, A. D. 1582. / Explained and Illustrated with Valuable and Copious Notes. / to Which Are Added, / Useful Tables of the Weights, Measures and Coins Mentioned in Scripture, / with an Evangelical History and a Controvesial Index. / also, / The Errata of the Protestant, or Sectarian Bible, / with Explanations and References, / Together with / The Principles of Roman Catholics, / and / Vindication, / Shewing Their Abhorrence of Certain Tenants Commonly Alleged against Them. 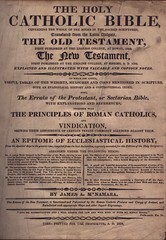 / An Epitome of Ecclesiastical History, / from the Apostles' Days to the Present Time, Compiled form the Best Authorities, Expressly Intended for this Edition of the Holy Scriptures, / by James A. M'Namara / This Edition of the New Testament, is Sactioned and Patronized by the Roman Catholic Prelates and Clergy of Ireland, and / Embellished with Appropriate Maps and Other Superb Engravings. / Cork: Printed for the Proprietor, A. D. 1818. Comments A reprint of the above edition. Title The Holy Bible, / Translated from / the Latin Vulgat: / Diligently Compared / with the Hebrew, Greek, and Other Divers Languages. / The Old Testament, / First / Published by the English College at Doway, A.D. 1609. / and / The New Testament, / First / Published by the English College at Rhemes, A. D. 1582. / with / Annotations, References, / and an Historical and Chronological Index. / The Fifth Edition. / Newly Revised and Corrected According to the Clementin Edition of the Scriptures. / Dublin. / Printed by Hugh Fitzpatrick, / for Richard Cross, No. 28, Bridge-Street, 1791. / Reprinted by James Christie, 170, James's. Street. / 1823. Contents The Bible in the Douay Version as revised by Challoner and MacMahon, complete only through Isaias, 13:2. References POPE 671-15, COTTON 399. Title page courtesy of the New York Public Library. 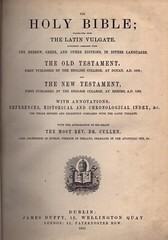 Comments A reprint of the original 1791 MacMahon revision of Challoner's text. It includes a detailed list of errors that had appeared in previous Douay Bibles. 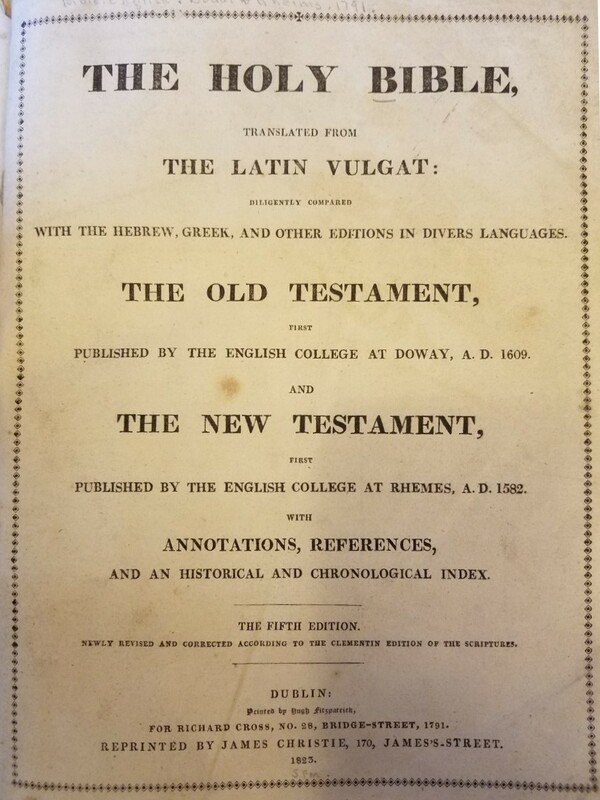 Title The / Holy Bible / Translated from / The Latin Vulgate, / Diligently Compared with the Hebrew, Greek, and / Other Editions, in Divers / Languages; / The / Old Testament, / First Published by / the English College, at Douay, A. D. 1609; / and the / New Testament, / First Published by / the English College, at Rhemes, A. D. 1582. / with Annotations, References, / and an Historical and Chronological Index. / The Whole Revised and Diligently Compared with / The Latin Vulgate. / The Stereotype Edition. / Dublin: / Printed by Richard Coyne, / Bookseller, Printer,and Publisher, to the Royal College of / St. Patrick, Maynooth. / MDCCCXXV. 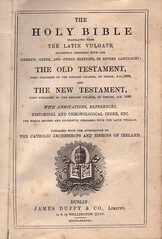 Comments Often called the "Murray Bible'" from Archbishop Daniel Murray, who gave it its Approbation. 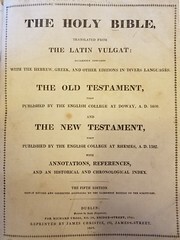 Reprints Of Coyne's "Murray Bible"
Title The / Holy Bible, / Translated from / The Latin Vulgate; / Diligently Compared with / the Hebrew, Greek, and Other Editions, in Divers Languages. / The / Old Testament, / First Published by the English College, at Douay, A. D. 1609; / and the / New Testament, / First Published / by the English College, at Rhemes, A. D. 1582. / with Annotations, / References, and an Historical and Chronological Index. / The Whole Revised and Diligently Compared with / The Latin Vulgate. / Published by the Approbation of / The Most Rev. Dr. Crolly. / Belfast: / Stereotyped and Printed by Thomas Mairs, / Joy's Entry, Opposite Bridge Street. / 1835. 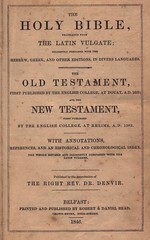 Comments First appearing in the previous year, 1834, this often reprinted edition appeared with local publisher imprints in England and America. Title The / Holy Bible, / Translated from / The Latin Vulgate; / Diligently Compared / with the Hebrew, Greek, and Other Editions, in Divers / Languages. / The / Old Testament, / First Published by the English College at Douay, / A. D. 1609; / and the / New Testament, / First Published / by the English College at Rhemes, A. D. 1582. / with Annotations, / References, and an Historical and Chronological Index. / The Whole Revised and Diligently Compared with the / Latin Vulgate. / Published with the Approbation of / The Right Rev. Dr. Denvir. / Belfast: / Simms & M'Intyre, Donegall Street. / 1839. References POPE 673-12, COTTON 146, CHAMBERLIN 21? Reprints Of The Simms M'Intyre 24mo. Title The / Holy Bible, / Translated from / The Latin Vulgate; / Diligently Compared with the / Hebrew, Greek, and Other Editions, in Divers Languages. / The / Old Testament, / First Published by the English College, at Douay, A. D. 1609; / and the / New Testament, / First Published / by the English College at Rhemes, A. D. 1582. / with Annotations, / References, and an Historical and Chronological Index. / The Whole Revised and Diligently Compared with the / Latin Vulgate. / Published with the Approbation of / The Right Rev. Dr. Denvir. / Belfast: / Printed and Published by Robert & Daniel Read, / Crown-Entry, High-Street. / 1846. Comments Reprints of this edition appeared in Ireland and America, the latter over American publisher imprints. Title The / Holy Bible; / Translated from / The Latin Vulgate; / Diligently Compared with / the Hebrew, Greek, and Other Editions, in Divers Languages. / The Old Testament, / First Published by the English College, at Douay, A. D. 1609; / and / The New Testament, / First Published by the English College, at Rhemes, A. D. 1582. / with Annotations, / References, and an Historical and Chronological Index, &c. / The Whole Revised and Diligently Compared with the Latin Vulgate. / Published with the Approbation of / His Grace the Most Rev. Dr. Murray, / Archbishop of Dublin. / Dublin: / Published by James Duffy, / 10, Wellington Quay. / 1847. Comments One of the most frequently reprinted Irish Douay Bibles, with some copies appearing in America. Title The / Holy Bible; / Translated from / The Latin Vulgate, / Diligently Compared with / the Hebrew, Greek, and Other Editions, in Divers Languages. / The Old Testament, / First Published by the English College, at Douay, A. D. 1609; / and / The New Testament, / First Published by the English College, at Rhemes, A. D. 1582. / with Annotations, / References, Historical and Chronological Index, &c. / The Whole Revised and Diligently Compared with the Latin Vulgate. / With the Approbation of His Grace / The Most Rev. Dr. Cullen / Lord Archbishop of Dublin, Primate of Ireland, Delegate of the Apostolic See, &c. / Dublin: / James Duffy, / 15, Wellington Quay. / London: 22, Paternoster Row. / 1865. Contents The complete Bible in the Douay Version as revised by Challoner. and later by MacMahon. Comments Another of the most frequently reprinted Irish Douay Bibles, with some copies appearing in America. Title The / Holy Bible / Translated from / The Latin Vulgate, / Diligently Compared with the / Hebrew, Greek, and Other Editions, in Divers Languages; / The Old Testament, / First Published by the English College, at Douay, A. D. 1609; / and / The New Testament, / First Published by the English College, at Rhemes, A. D. 1582. / with Annotations, References, / Hstorical and Chronological Index, etc. / the Whole Revised and Diligently Compared with the Latin Vulgate. / Published with the Approbation of / The Catholic Archbishops and Archbishops of Ireland. / Dublin: / James Duffy & Co., Limited, / 14 & 15 Wellington Quay. / MDCCCLXXXVIII. Comments A larger Octavo edition with a different typeface than Duffy's small octavo (above).